With the wind howling around the verandas and the rain lashing down it’s hard to remember when the sun beat down on the kitchen garden. Even when we didn’t get much sun this summer I would pick those days over what winter is starting to throw at us right now. Even if I did end up with an over supply of green tomatoes. 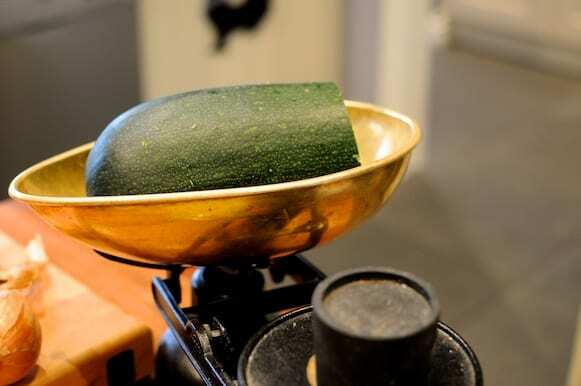 Back in the warmer days of Spring, I threw caution to the wind and was a little enthusiastic in my propagation of courgette plants. Seemed a shame to waste them although at that time I didn’t quite appreciate the sheer productivity of this plants. My final fling to use my courgette harvest was the perfect match for my green tomatoes to produce a seasonal chutney using a recipe from The River Cottage Preserves Handbook. 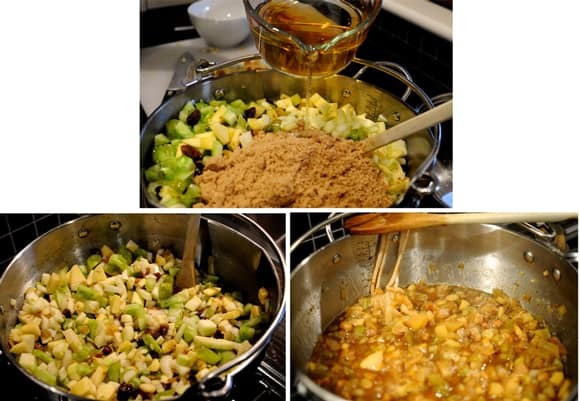 Another first at Domestic Executive HQ, chutney making was a communal event since the hard slog was in the chopping up of all the vegetables. With the Archers playing in the background we spent a happy hour preparing everything. Oh the simple pleasure of country life, you could almost imagine Jill Archer popping up to check on our chutney making technique. Thank goodness for my new preserving pan which came into its own. Large enough to take the massive piles of chopped fruit and veg. It was amazing how easily it went from vegetables from the garden to an aromatic concoction that was crying out for some mature cheese and soda bread. 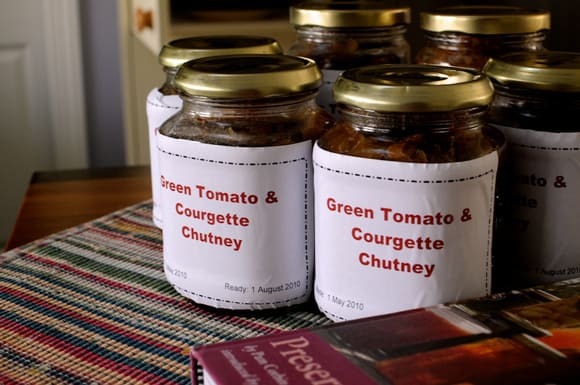 I potted up the final chutney and dashed off some labels on the computer. I rather wished I’d spent more time putting together a rather more ornate design but I’ll work on that as a winter project so come next year we’ll have something a little more stylish. It takes a couple of months to mature so I’ve packed the jars away till August. I think we might cheat though and have a ceremonial chutney opening a few days early when we’ll be taking a staycation at the end of July. OK, to be honest we didn’t wait but threw a jar of the chutney into a lamb and squash curry (another Fernley-Whittingstall recipe) and I can’t be sure if it was the home grown squash or the home made chutney that made that curry one of the tasty I’ve eaten. Living off the land sure is a a time consuming thing. Things this year have been a bit slap dash and seat of pants but I’m determined to get ourselves set up for a real bumper growing year next season. This includes sorting out the barn for raising seeds, buying a chest freezer so we can keep more of our produce not to mention getting more soft fruit planted so we can make more jams and sauces. I’ll be back in a few weeks to tell the tale of our first real taste of seasonal chutney – bet you can’t wait! Wow! So much work, but your love and enthusiasm clearly shines through in all that you do and the results sound amazing. In a year or two you’ll be putting a sign on your gate to sell your produce!